the 2015 Taipei Lantern Festival at Taipei Expo Park was one of the places that R and I visited during Valentine’s Day weekend this year. The last time we saw such lanterns was back in 2012 when we went to the Lukang Lantern Festival with Tiger girl. The lanterns on display in Taiwan were certainly very different from the ones that we see around Chinatown during Chinese New Year or the mid autumn festival. These lanterns are made by students and are all entries in the best lantern competition. One of the exhibits on display. Children as young as elementary school students are encouraged to take part in this competition. As you can see from the picture above this was one of the entries done by a group of elementary school students with the guidance of their teachers. Each lantern was built based on a theme as you can see the one above was filled with different sea creatures. Don’t they look cute? There were many lanterns which were created to look like sheep as 2015 is the Year of the sheep. Three sheep with auspicious blessings. Besides sheep there were lanterns based on various cartoon characters like this Dog head train. Some lanterns were built to resembled part of an amusement park like this roller coaster shown here. Even the circus clowns were represented among the different lanterns which were on display in the park. Fairy tales and Folk tales were the featured themes for some of the lanterns. I saw Cinderella’s carriage on display while walking through the park. Lanterns based on folk tale. I can’t remember off hand which story these characters were depicting but it was certainly nice to see them in traditional costumes. Have you been to a lantern festival before? 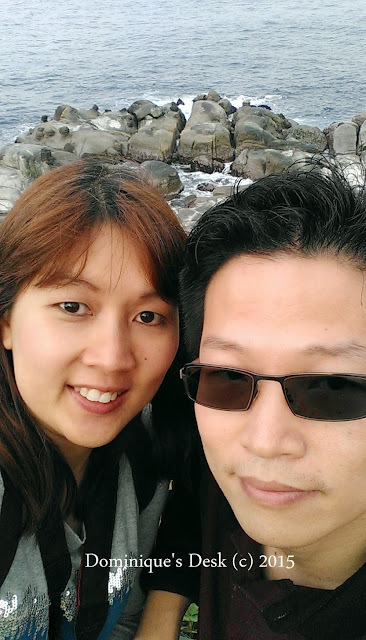 During the Valentines Day holiday trip R and I drove up to Keelong City 基隆市. I’ve always love visiting the seaside and experience the sea breeze blowing in my face. We drove from Shifen Waterfall Park to Keelong as it was on the way. The journey didn’t take too long and we manage to find the place following the GPS in the car. 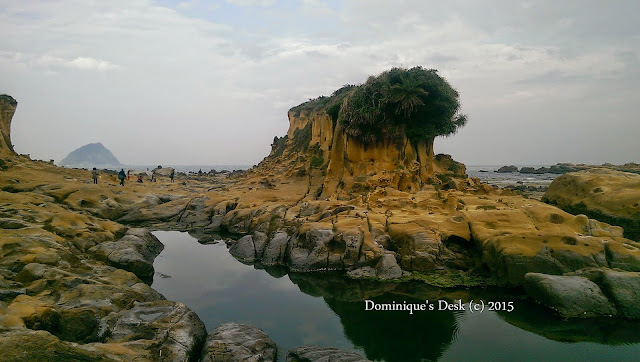 The last time I saw unusual rock formations was in Jeju island where we saw the Jusangjeolli Cliffs. These formations were spread out over a bigger area as compared to those cliffs. This particular rock formation required some vivid imagination on the part of the viewer to see how “turtle” it looked like. The pavilion made a good resting spot to sit and admire the scenery. We didn’t really spend much time there when we were there as I was more keen to view the whole area. We only stopped long enough to snap some pictures and a wefie. 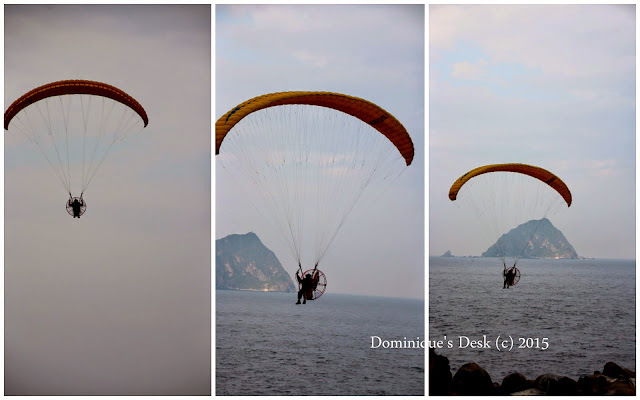 While admiring the scenery we saw this parasailer moving near the rocks. He had a motor attached to the back of his set up and was able to control how high or low he flew. I would love to try parasailing one day but not sure if I will do solo like this parasailer. There were many unusual rock formations around and people ventured out onto the rock formation for a closer look. R and I however kept to the path as I didn’t want slip while being on the rock as the ground was rather wet. Another shot of the same rock formation. This time with my HP. Have you seen rock formations at the seaside lately?